Thanks to the sponsors, who funded the sign, Bill Oudegeest, who had it manufactured and who placed it, and the Donner Summit Historical Society, the new George R. Stewart Interpretive sign is now on old U.S. 40 near the summit of the historic highway. If you plan to drive I 80 from San Francisco to Reno, or from Reno to San Francisco, or points between, take a short detour on Historic US 40 to see the sign. It’s not a long detour, goes from Soda Springs to Truckee, but it’s much more scenic than I 80. It’s a gentle, curving road which follows the shape of the mountains, which include George R. Stewart Peak just above the sign. The highlight of the old highway is the “Rainbow Bridge,” just east of the pull-out where the GRS sign is located – the view is magnificent from the scenic turnout at the bridge. The Stewart sign is one of many placed by the Donner Summit Historical Society on historic US 40. Called the “Twenty Mile Museum,” the collection of signs interprets the extraordinary history of the road, and the Donner Pass country – railroad pass, wagon route, early highway route….there’s even a Walt Disney connection. Take your time, and enjoy that trip across the Sierra in educated leisure. The GRS sign is also near the trailhead to the Pacific Crest Trail. Follow the trail a little south of Historic US 40 to find a short spur trail up to the summit of George R. Stewart Peak. The view from the peak is even better than from the Rainbow Bridge. 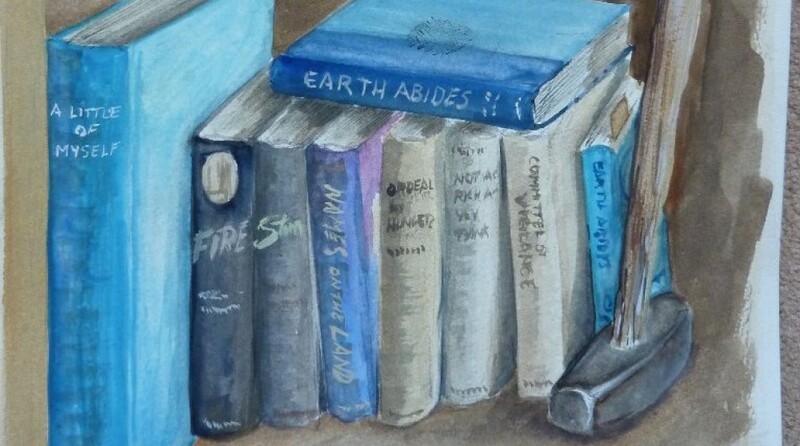 If you want to learn more about Stewart, you may want to read some of his books, like Earth Abides, Storm, or Ordeal By Hunger. Storm and Ordeal by Hunger center on Donner Lake and Donner Pass. Storm is almost entirely focused on the historic Highway in a massive storm named “Maria[h].” It’s the book from which we get the practice of naming storms. Or read my biography, The Life and Truth of George R. Stewart. It’s not inexpensive – costs about as much as two large pizzas – but it tells his story in detail. But whether you do the reading first or not, please take the time to travel Historic U.S. 40 over Donner Summit; and stop along the way to read the GRS Interpretive Sign. BIG NEWS: THE GRS BIOGRAPHY HAS JUST DROPPED IN PRICE ON Google Play BOOKS TO $3.99! This entry was posted in Uncategorized by rangerdon. Bookmark the permalink.